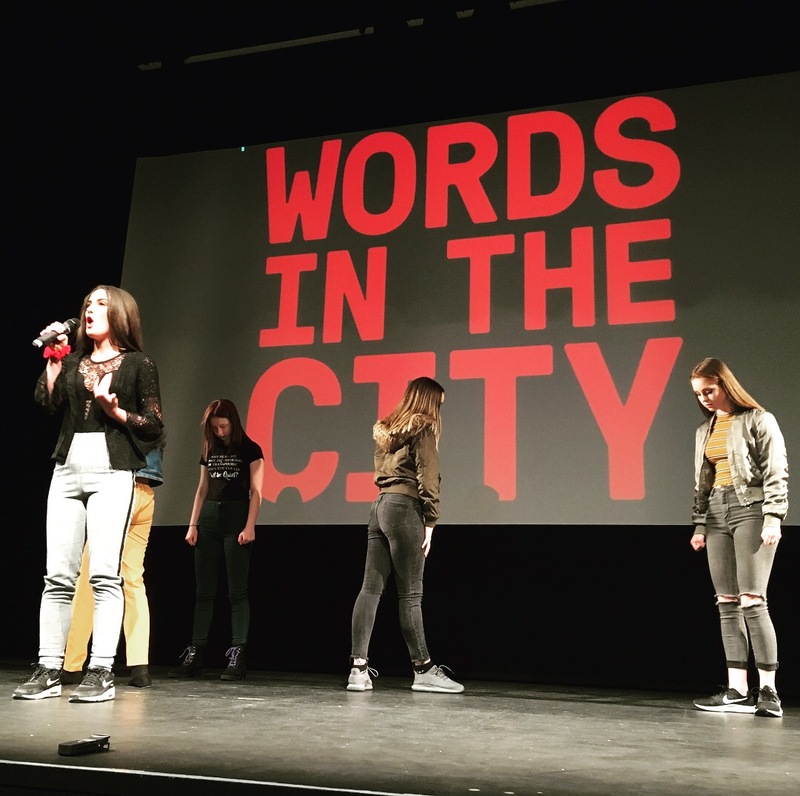 As part of our outreach work for Words in the City Leeds we hosted our first ever school poetry slam, which was a huge success. The slam enabled seven secondary schools in Leeds (Allerton High, Allerton Grange, Cardinal Heenan Catholic High School, Cockburn High, The Cooperative Academy, Crawshaw Academy and Farnley Academy) to host a round in their school, where 60 pupils worked with a poet to write spoken word poetry, then compete against their classmates in two rounds of competition. Six of the schools then brought their two winning teams from the first round to the Carriageworks Theatre for the final, as part of the Words in the City weekend. Our judges were spoken word artists Adam Kammerling and Marv Radio, who awarded the title of Slam Champions to Crawshaw Academy. Second place was awarded to Allerton High, with The Cooperative Academy taking third. A team from Cardinal Heenan took the “Best Performance” prize and The Cooperative Academy scooped a second award for “Best Line”. Alison Smith, our Education and Outreach worker, and poets Sai Murray and Andy Craven Griffiths, who facilitated the slam, were extremely impressed with the enthusiasm and talent on show from all 360 pupils who took part. Many pupils had never written a poem before or performed in front of others, and all responded with courage and creativity! We were really keen to empower the young people, showing them that spoken word is a fantastic format for sharing their voices. We were hugely impressed with the depth, insight and maturity their pieces showed, which explored topics which included youth stereotypes, peer pressure, families and cultural heritage. I was able to write my own rap and talk about my culture and share it with people from other schools. I learnt that poetry is not all about just speaking you can rap and talk about anything you want for you voice to be heard and people notice you. I enjoyed performing in front of everyone… I learned that you don’t need to be scared in front of anyone and how to be confident and have a voice too. It was a wonderful day and we felt very proud of our students. They were both completely mixed ability groups and many had no experience at all of poetry. For them to be able to go up on the stage like that in front of so many people was amazing. The quality of some of the performances was astounding. With some schools struggling to prioritise creative subjects, we believe that projects like this are hugely valuable, as they allow young people to share their voices and develop confidence, regardless of their academic level. We witnessed teachers’ surprise as pupils who often struggle to engage excelled in creative writing activities, and watched as pupils who were very nervous to begin with came out of their shell to deliver outstanding performances. We hope to be able to make the schools slam an annual event as part of Words in the City, and involve even more schools in future years.